Stephanie Meadow lies in second place, two shots off the lead, after round one of the Kia Classic in California. The Northern Ireland woman carded an opening 67 at the Aviara Golf Club in Carlsbad to leave her chasing leader, South Korean Chella Choi. Meadow, 27, completed a bogey-free day with five birdies while Choi birdied the final three holes to top the leaderboard on seven-under-par 65. A 15-strong group make up the chasing pack in third, one shot behind Meadow. England's Mel Reid sandwiched a bogey on the par-five eighth hole with two birdies to finish in 26th on two under. 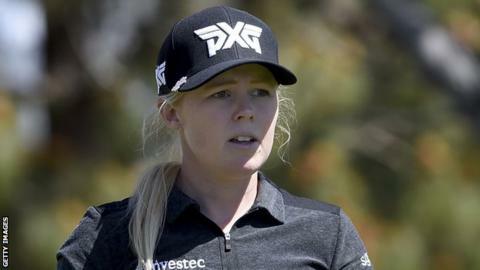 Jodi Ewart Shadoff and Bronte Law both had to settle for rounds of 72, each making three bogeys, and Scotland's Catriona Matthew bogeyed the last to join them for a tie in 51st place. Meadow regained her LPGA Tour card in October, having spent a year on the Symetra Tour following a lower back stress fracture.